The movie may have come out in 1993, and wasn't exactly a big hit, but Hocus Pocus costumes are still a hot item for a lot of party-goers. 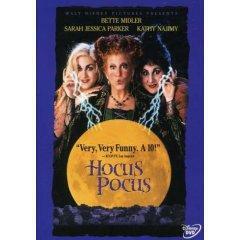 These are witch costumes to make a splash in, and the three Sanderson sisters make for a great group costume as well. The costumes for Winnie, Sarah and Mary Sanderson are, in a way, almost less distinctive than their elaborate wigs and makeup. Although the Mary Vogt-designed costumes are exquisite, they still have the appropriate look of wealthy women's clothes in the late 17th century, with a slightly Renaissance look added so that the witches look more timeless, elegant and foreboding. It's an impressive feat on Vogt's part and little wonder that people are anxious to emulate it. Although elaborate, the dresses are not in the best condition - they are, after all, 300 years old and being worn by women who are technically dead and rotting. Winnie's dress is green, Sarah's pink and black and Mary's red. Winnie's hair is red and owes a lot to the vague devil-horn look sported by the original Broadway Mrs. Lovett in Sweeney Todd (although, with her lack of eyebrows, she also looks a bit like a wicked Queen Elizabeth). Sarah's hair, on the other hand, is long and blond - very Veronica Lake. Mary's hair is black and piled on top of her head almost in a pyramid. Add Winnie's buck teeth, Mary and Sarah's heavy eyebrows and some assorted facial moles, and then the dresses themselves almost become besides the point. There are a lot of witch designs that call themselves "Hocus Pocus" costumes, but most of them are not related to the movie. Since the film is by Disney, there are strict licensing rules involved, so you cannot get a costume that will match those in the film. However, any Goth or medieval maid witch costume will probably do. You don't even have to opt for a witch costume, if you obtain a medieval or Renaissance peasant costume and distress it lightly, and then add the appropriate hair, makeup and accessories, you will have yourself a fine Hocus Pocus costume. To get a good idea of what might work, go to Anytime Costumes, which has a picture of a plus-size witch costume that will suit the Hocus Pocus look. Don't be intimidated by the idea of making the costume yourself. Remember, it's about trying to create a look and it doesn't have to be perfect. Perhaps if you're a professional seamstress, you can whip up an exact copy of one of the costumes in a few days, but the truth is, you don't even have to sew to be able to put together one of the Sanderson sisters' dresses. The decaying quality of the dresses is in your favor when pulling something together. You can even use some scraps and bits of old costumes. The dresses are also layered, so that you can even start with a leotard in the appropriate color and use ribbon to create the look of a bodice. Hit a thrift shop and look for robes in the right colors. Robes will have texture and you can use fabric paint to add embellishments. Collars can be made using cardboard covered in fabric or painted. Trim is your friend. Look for cheap wigs at thrift stores, on eBay or Craig's List. You will wear a stocking cap underneath, so a quick wipe with vinegar should get it clean enough. For a wig like Winnie's, you want pins and hairspray to get it in the right shape. You can also use wire, but pins will probably do - it only has to last the night, after all, and then, just like the Sanderson sisters, it can dissolve.